SeaWorld Rescue are helping manatees poisoned by a deadly red ride on the southwestern coast of Florida. Many marine animals like fish and turtles are at risk, and manatees are particularly vulnerable as herbivores that eat algae. The red tide is also known as a harmful algal bloom. This occurs when normal algae – plants that live in the sea and freshwater – grow out of control, producing toxins that can harm people, fish, marine mammals and birds. The red tide organism in Florida is called Karenia brevis. In high quantities, it can kill fish and even larger marine animals, including manatees. Not only do they swim and eat plants in the toxic water, the air they breathe also becomes toxic because of the red tide. How is SeaWorld helping manatees? 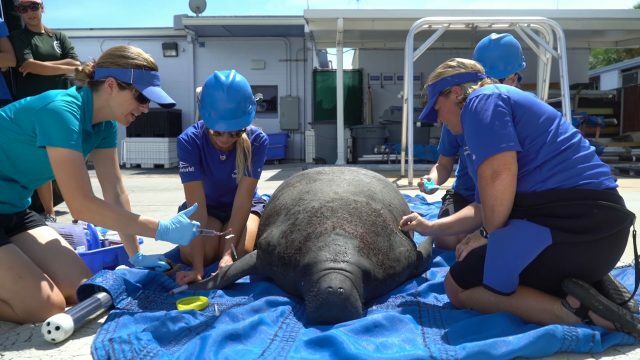 In partnership with the Florida Fish and Wildlife Conservation Commission (FWC), the SeaWorld Rescue team has taken in 10 manatees affected by red tide, treating them at SeaWorld’s critical care facilities, while readying supplies and equipment for red tide-related rescues and treatment in the coming months. SeaWorld is treating the most critical cases, while manatees requiring continued care are relocated by the Manatee Rescue & Rehabilitation Partnership (MRP) to other local facilities. What will happen to the rescued manatees? The aim is to return manatees to the wild once the red tide subsides, but the FWC predicts the toxic algae will continue blooming into 2019. SeaWorld and their partners will care for them until it is safe for them to be released.